This review was originally published in Swedish on the website Frihetssmedjan in June 2015. Björn Wahlroos is a well-known figure in the Scandinavian finance sector, as a chairman of Nordea, the 9th largest European bank by market cap and Sampo, the holding company of IF (the largest Insurance company in Sweden). He has a Ph.D in Economics and used to teach at Brown University, Northwestern University and Hanken School of Economics in Helsinki, Finland. To my knowledge the book has not been translated from Swedish, and so those curious about Wahlroos may have to learn a new language beforehand. Summary: Wahlroos has produced an impressive critique of the economic myths most prevalent in contemporary politics. The book is powerful yet comprehensive, and turns self-evident “truths” in the political world upside-down. It is hard to see how left-wing economics can reasonably remain standing after this vicious attack. When Björn Wahlroos recently released his book, De 10 Sämsta Ekonomiska Teorierna – Från Keynes till Piketty [Eng: The 10 Worst Economic Theories – From Keynes to Piketty] he received much attention in various Scandinavian media, especially when he called the economist Piketty’s celebrated book about inequality “700 pages of unqualified garbage”, and before that argued that 80% of people are idiots. The book itself has received much positive response and is a fresh element in an otherwise quite rigid politic landscape with respect to economic matters. Despite the fact that Wahlroos explicitly tried to write without too much economic jargon requiring an economics degree simply to decipher the meaning of the text, a few of his chapters falls pray to precisely this impulse. The best and most controversial chapters, however, are largely free of the diagrams, the confused equations or weird words and symbols that otherwise dominate mathematical economics. 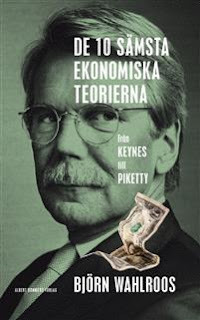 Among the ten myths that Wahlroos so brilliantly attacks we find the climate movement’s hatred towards capitalism (the chapter titles express the myths: “Capitalism exploits natural resources”), left-wing economists’ indignation towards cutbacks in public spending (“Austerity kills economic growth” & “Higher taxes reduces deficits”) as well as the efficient market hypothesis. The best of Wahlroos stinging and systemic critique of left-wing economics is more appropriately targeted toward the inequality crowd of recent years: Piketty, Stiglitz, Krugman and Wilkinson & Pickett. Nobody who listened to Wahlroos’ Sommarprat 2014 (popular Swedish radio program) will be surprised that he sincerely despises Piketty for the academic and conceptual failures of his work. Piketty would have us believe that r was simply deposited in the capitalists’ account at the end of the year, when in reality the average return on an asset varies with the amount of risk associated with that investment. With no exposure to risk, the capitalists could earn perhaps 1%. The rest of an expected return of 5% is compensation for accepting that the return can be anything between +30% and -20%. But the average capitalist still earns 4% more than the workers, Piketty says, and he’s right. But the point is that not all capitalists do. Some – those who are either lucky or knowledgeable – will make much more, while others go bankrupt. To make more than 1% they who are still in the game have to enter the race next year, taking the same risks, and again some will win while others will lose. After comparing risk-free return on several different markets, in Europe, the U.S. and Asia, Wahlroos finds that “the risk-free return was not higher than the economic growth, but substantially lower” (p. 140). Towards the end, Wahlroos brings up Piketty’s troubling neglect of human capital, i.e. the skillset and knowledge that we have in our minds. As many others have pointed out, McCloskey, Mankiw and Magness included, Wahlroos argues that the change in income distribution over the last few decades reflect a higher return to human capital as well as a globalised world; when the creations of Steve Jobs, J.K. Rowling and Spielberg can be seen and experienced by billions rather than millions of people, any other development than a widening income distribution would be strange. This was just an extract of all the grandeur contained in Wahlroos’ book. It’s an absolute must-read for anyone who wants to understand what’s wrong with today’s political discussion about economics, and who wants to disprove the left’s attempt at economic theory. A perfect summertime read that will guarantee much joy and revelation.